Chevron produces energy to meet the world’s needs, but Chevron itself is a product of its workforce and ingenuity. The “Day in the Life” series showcases that ingenuity, our Human Energy, at work across the breadth of our businesses. Through this series, we highlight the people who make our company unique, as they give us an insider’s look at their work days and share a bit about their lives at Chevron. In this episode of the “Day in the Life” series, Colter Morgan explains how being a factory coordinator supports our Permian Basin shale and unconventional operations. Growing up in West Texas, Colter Morgan felt the oil industry was in his blood. 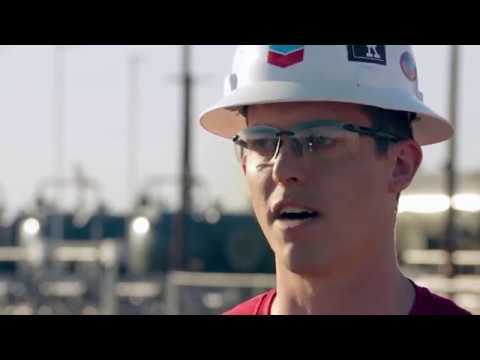 After majoring in petroleum engineering at Tulsa University, he joined Chevron and was excited to be assigned back home to Midland – and to our thriving shale and unconventional oil and gas operations in the Permian Basin. achieving “best in basin” through scale, ingenuity and efficiency. "I love working out here. I love partnering with the community and with the people out here, because they really understand what oil and gas means not just to this community, but to society as a whole."